Disease development is dependent on susceptible plants, a favorable environment and a pathogen. Diseases will not occur unless all factors are present simultaneously over a certain period. Management practices that favor a healthy turf such as planting improved, adapted cultivars, proper fertilization, and timely watering (for example, avoiding late evening watering) can prevent or limit turf injury by diseases. Inspect your lawn frequently to detect diseases early. Correct identification of a disease may require the assistance of a qualified individual. Environmental stresses, improper lawn care practices, and insect pests often display symptoms that resemble diseases. If a fungicide is necessary, correctly identify the disease, select the proper fungicide, follow label directions, and apply it at the correct rate and time. Contact your county extension agent, another qualified individual, or refer to the North Carolina Agricultural Chemicals Manual for additional information. Circular brown areas up to 20 feet in diameter that develop during cool, wet weather in the spring or fall. Leaves wilt and die, resulting in large brownish tan areas. 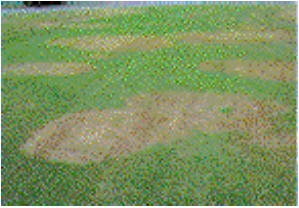 Brown patch usually is present in bermudagrass at time of spring greenup. Provide good drainage and avoid excessive nitrogen fertilization. The turf usually recovers in warm, dry weather. Figure 2. Time brown patch occurs. Circular dead areas appear in the spring and continue to enlarge during the summer. 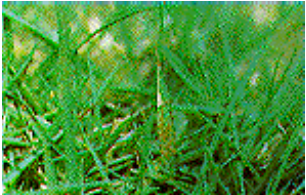 Grass at edges of areas may yellow, wilt, and die during stress periods. Maintain soil pH between 5 and 5.5 and avoid excessive rates of nitrogen (use 1 lb N or less / 1,000 sq. ft. / year) and phosphorus fertilizers. Ensure adequate potassium in summer and fall. Maintain the turf at 1 inch mowing height and apply iron to foliage if yellow. Avoid drought stress. If nematodes are causing the decline, irrigate as needed or select another type of grass. Figure 4. Time centipede decline occurs. Straw-colored patches 2 to 6 inches in diameter develop in late summer. Light tan lesions with reddish brown margins develop across leaves. Adequate fertilizer will help the turf overcome this disease. Irrigate turf as needed to avoid drought stress. Figure 6. Time dollar spot occurs. Large arcs or rings of very green grass, dead grass, mushrooms, puffballs, or a combination of these symptoms. Remove organic matter (stumps, waste lumber) from soil before planting. Power rake to remove thatch when it exceeds 1⁄2 inch. Remove soil cores, spike or force water into affected areas to allow nutrient and water penetration. Avoid overfertilization in an attempt to mask the green rings. 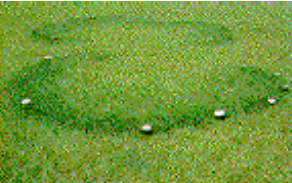 Soil fumigation or rototilling and replanting may eliminate fairy rings. Oval or circular tan lesions that are bordered by purple to brown margins develop in warm, wet weather. Leaves wither and die if many lesions develop, giving the turf a brownish color. Avoid excessive fertilization with nitrogen when warm, humid weather is expected. Avoid late afternoon and evening watering. Prune trees and undergrowth to improve air movement and light intensity. Figure 9. Gray leaf spot. Figure 10. Time gray leaf spot occurs. 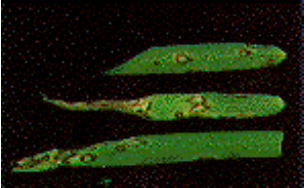 Dark, circular, or oval-shaped lesions develop on blades and stems. Some lesions become red, purple, or tan with dark margins. 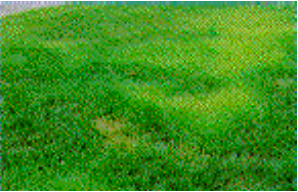 Turf appears yellow to brown if the disease is severe and becomes thin. Fertilize properly and avoid close mowing in late spring and summer. Keep mower blade sharp. Water deeply but infrequently and avoid prolonged leaf wetness. Small yellow specks on leaves and stems that develop into orange or red pustules. 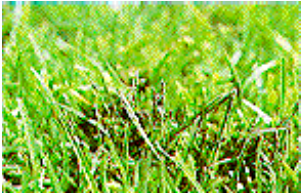 Heavily infected lawns take on orange or reddish hue and the turf becomes thin and weak. Rust is most often a problem in lawns with too much shade. Ensure adequate fertilization and dispose of clippings when symptoms are evident. Remove excess shade and maintain good soil moisture. Several fungicides can be used to help control the disease. Figure 14. Time rust occurs. White, gray, powdery fruiting bodies that cover leaves in patches 6 to 12 inches in diameter during warm, wet weather. Fungus usually disappears during dry weather. 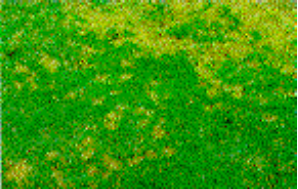 Dead spots appear in the spring as grass resumes growth, usually after lawn is at least 3 to 5 years old. Spots expand for 3 to 4 years, often developing into rings, and then disappear. Infected areas recover slowly and weeds frequently invade these areas during the summer. Avoid excessive nitrogen fertilization and do not apply nitrogen after late August. Raise mowing height and ensure adequate potassium in the fall. Reduce thatch by aerifying and pulvarizing soil cores. Some fungicides can be used in the fall to control this disease. Figure 17. Spring dead spot. Figure 18. Time spring dead spot occurs. 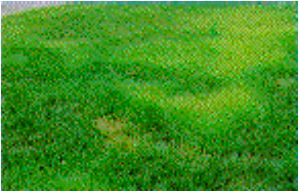 Turf becomes thin and does not grow well following fertilization and irrigation. This occurs most often in sandy soils. Roots are shallow and may be killed. Have soil samples assayed by the North Carolina Department of Agriculture & Consumer Services to determine if nematodes are a problem. Plant the best-adapted turfgrasses and ensure adequate fertilization and irrigation to help overcome nematode damage. 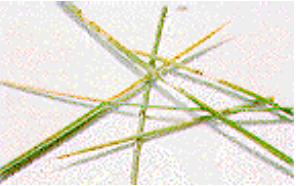 Nematicides are not labeled for use on residential turf. Many pest problems that cause your turf to look bad--diseases, weeds, insects and animals. If you are really unlucky, you may have all of them at one time. Early detection and prevention, or both, will minimize pest damage. saving time, effort and money. Should a problem occur, determine the cause or causes, then choose the safest, most effective control or controls available. When chemical control is necessary, select the proper pesticide, follow label directions, and apply when the pest is most susceptible. Treat only those areas in need. Regard pesticides as only one of many tools available for turf care.